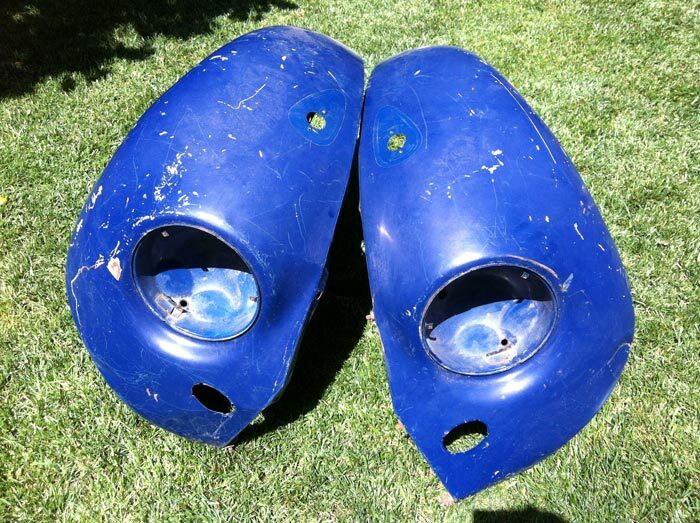 Not too long ago, I seemed to have a pile of German ’67 Beetle front fenders. I’m not sure if it was living in Nor Cal at the time or what. But, hoarding became an issue so I decided to put out some smoke signals to the ’67 Beetle community. 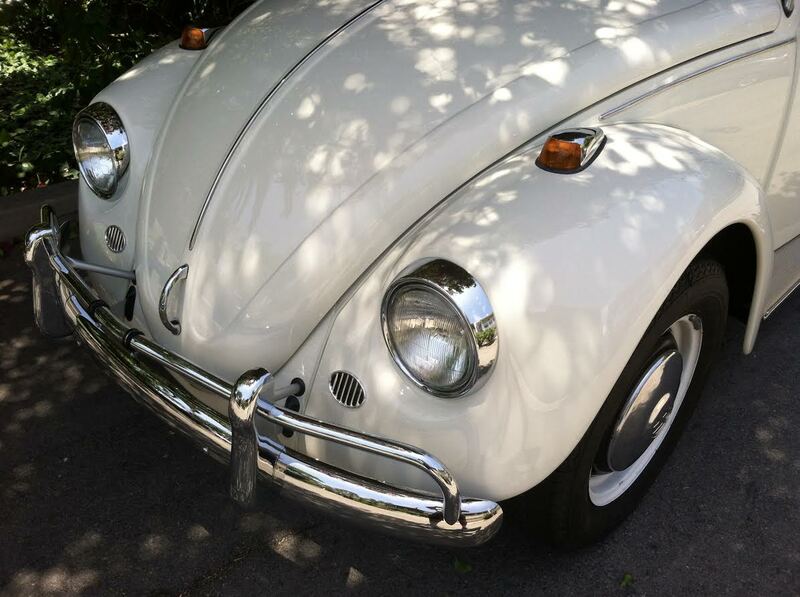 In case you don’t already know, German ’67 Beetle front fenders are getting harder and harder to find. I started to receive inquiries. However, I had this sensitivity towards these fenders. What if they ended up on some chopped Baja, or a slammed hood ride. To each his own. It’s just that you can’t walk into a dealership and buy one of these cars. Those days are long gone. We have to do what we can to protect all ’67 Beetles. Finally, our good bud Mike Buettell came into the picture. He was interested in my collection for his own ’67 that our friend Lenny Copp was about to begin. I felt confident they would go to a good home. Mike drove almost 1,000 miles to meet with me to pick them up. He event took a drive in my own ’67 Beetle. We joked about the idea of, “what if these fenders could talk?” Would they speak of the beauty of coming off the ship from Germany, making their first drive on the US market? Ah the history of these great cars. The best part is, it’s all because of 1967beetle.com. When I created this project, I had no idea so many people would take interest around the world. So, here we are. Thanks for that. Mike explains below the continued journey of these fenders, long after they left my hands. The history of the fenders is fascinating. Maybe Eric knows the history prior to his drive to Santa Rosa, but here is what happened after he got it. He had three fenders in his garage until he and/or his wife said, “These things take up too much space.” and he agreed to sell them to me. I drove 967 miles, round trip, from Newport Beach to Alameda to get the two blue fenders and the white one. The blue ones went on Luna and the white became a “Coffee table” on my upstairs porch for a year. (Leaning upright against the wall it held one cup of coffee quite well). In April I found a crazy Russian, with an enclosed truck traveling between LA and Seattle who took Luna and the white fender, in her rear seat, to the Pacific Northwest. 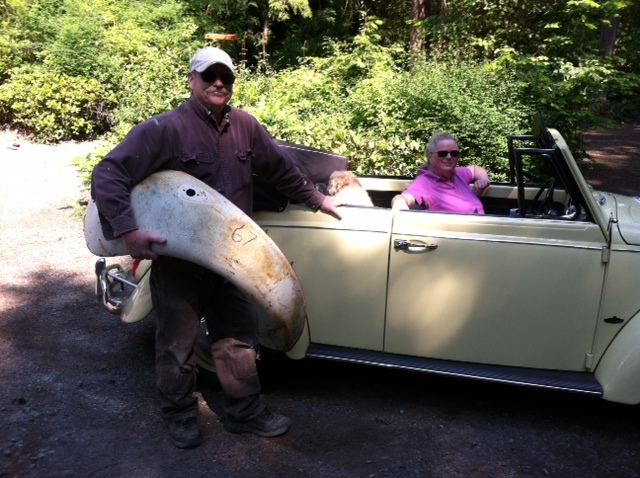 The well-traveled white fender now resides in Gary and Donna’s garage here on San Juan Island WA. We so much appreciate Mike passing along Luna’s step-fender. One day in the future it will grace the front of Wally2. Former owners Eric & Mike can be rest assured that the fender will be treated with the respect it rightfully deserves. BTW: In our defense, Mike took us by surprise the day he came by to snap the photo, we were working in the yard (Gary was forming for a concrete pour), prepping for our daughter’s upcoming wedding. Usually we look less like Ma & Pa Kettle and more like the ’67 VDubbers we truly are in our hearts!. Great article Eric. Even better fenders! Eric; This summer marks the fourth year we purchased our 7 SNR. Already restored in Lotus white the Lady teacher needed cash for a trip to Austraila. The bumper had been pushed slightly into the LF fender so i had the bumper straightened and repainted the brackets. Then after it was all back together i noticed from a distance something just didn’t look right. The alignment looked wrong. To make along story shorter, I soon discovered the LF was a reproduction with the incorrect horn grill placement. A search on good old Craigslist i was very lucky to find a OG fender from a Baja project that recycled onto our stock 7. The world is right again that only a 67 enthusiast would appreciate. These details matter. Good job. It’s stories like these and your incredible website, which inspired me to acquire a ’67 model. A journey which ultimately led me to a very special 1967 Beetle, that once had blue fenders and became fresh L282 Lotus White all over again. It certainly makes for a good story and there is more to tell. For now, I’m enjoying the excitement and elation of becoming the new caretaker (owner) of Mike Buetell’s fantastic 1967 Beetle. Much gratitude and thanks to Eric Shoemaker for being the catalyst that made it happen! Thank you Jay! I’m looking forward to this new relationship and sharing it here as well! We’re excited to see where this ’67 goes next. Mike is a great guy, along with the rest of the readers around the world. Thank you!